Welcome to our luxurious and comfortable home from home,here you will find all that you need for a relaxing break. 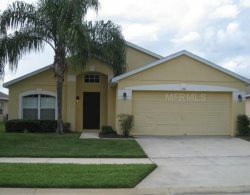 Our villa is located off highway 27,just 5 minutes from the I 4,and 7 minutes from the 192.on the prestigious countryside at Tuscan Ridge community. We are just minutes from Disney world,several golf courses, premium outlet shopping,supermarkets, restaurants,bars and an imax cinema. We are not overlooked,as we are set on an elevated plot that is larger than most in the Disney area. Our villa comfortably sleeps 8 people and is perfect for 2 families sharing Enjoy our spacious rooms,a private secluded swimming pool,games room,a well manicured lawn and barbecue area,and a lanai/terrace area for comfort and relaxation in the day or the evening The villa is fully air conditioned and every room has a ceiling fan for your comfort The entrance hall has an informal seating area with a relaxing view out on to the pool. There is a dining table that comfortably seats 8 people The Palm Room The master bedroom has doors with a wonderful view,with doors that lead out to the deck and pool.It has an American king bed with a memory foam topper and luxury pillows for a restful nights sleep,plenty of storage space and a flat screen 40" HD TV with HD satellite channels this leads into a walk in wardrobe with ample storage space and hanging rails,this bedroom has a luxurious end suite bathroom totally private from the rest of the villa with a large Roman tub,separate WC ,and a large oversize walk in shower,his and hers sinks,vanity units ,storage and a hairdryer. All towels and linens are provided. The modern open plan kitchen/living area has everything you need,and is fully equipped with a coffee machine,blender,kettle,toaster,dishwasher,huge American style fridge/freezer with ice dispenser,waste disposal,electric can opener,and water filter,gas oven and hob and eye level microwave.our cupboards contain everything you could want ,including crockery,glasses,cutlery,plastic pool ware,pots and pans and all the utensils you could need. We have a breakfast bar for relaxed breakfasts and snacks or get comfortable in our breakfast nook,which has views out to the pool. The Turquoise Room and the Stars & Stripes Room Just past the kitchen there are 2 bedrooms,1 double and 1 twin,both bedrooms have 32"HD TVs with HD satellite channels,the have lots of storage space,concealed wardrobes,bedside tables and lamps for reading. Both bedrooms share a bathroom with vanity unit,a bath with an overhead shower, a WC,storage,hairdryer and all linen and towels are provided. The main living area has2 large leather sofas a large flat screen 50"HD TV,HD satellite channels and a DVD player,it has large doors that lead out on to the pool area. The Teal Room The queen bedroom has lots of storage space,concealed wardrobes,flat screen 32" HD TV with HD satellite channels,all linens and towels are provided. This bedroom also has an ensuite shower room with lots of storage,a hairdryer and doors that lead out to the pool. Utility room We have an American washing machine and tumble drier that can accommodate the largest of loads,clothes airer,iron,ironing board,2 large laundry baskets(perfect for 2 families sharing)and plenty of beach towels. We hope you enjoy our newly installed games room,we have a pool table,air hockey table,a seating area with tables for drinks a TV and hi fi,there are 2 tennis racquets and balls for use at the private tennis courts,there is also a fan for your comfort. You will also find a high chair that is for your convenience The games room has a hand painted Disney/Universal mural,how many characters can YOU spot? The heated pool*and deck are true south facing(meaning you get the sun ALL day),but there is shade under the lanai if you want it. *Pool heating is available if you require it at extra charge there are padded sun loungers,with side tables for drinks,padded chairs,and a dining area, We have an in ground spa,where you can sit and let the bubbles gently massage your muscles (just the thing after a long day at the parks! )you can plan the next day's adventures,or enjoy a relaxing evening around the pool as the area has lights and fans to keep you cool in the balmy Florida evenings. The deck is the perfect spot to watch the gorgeous Florida sunsets! the pool has lights too,just the thing for that refreshing late night dip! The pool is screened by a pomelo hedge(if you are staying when the fruit is in season,help yourself!-the perfect breakfast!) The pool area is fully screened to let the sunshine in,but keep the bugs out! We have provided a barbecue free of charge,just call the management company to arrange gas for a small fee You don't need to look any further we have done all the hard work,so you don't have to!